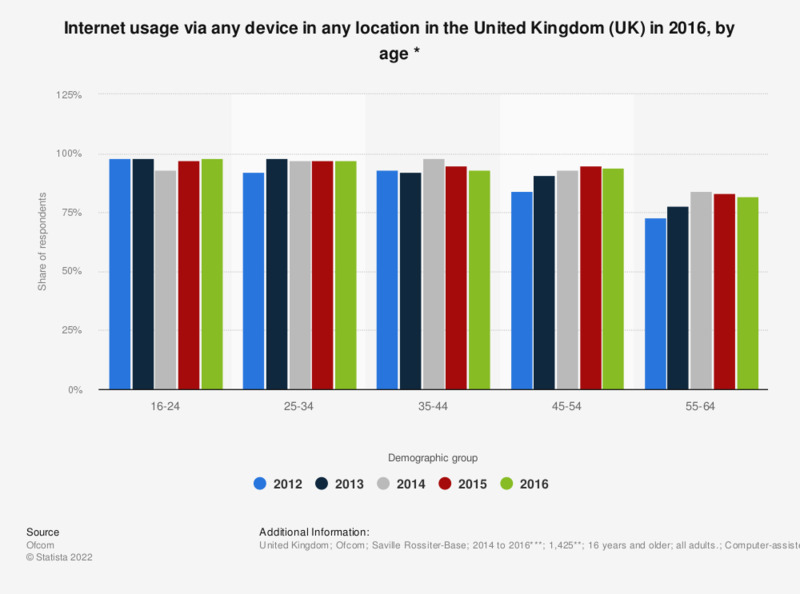 This statistic displays the results of a survey on internet usage in the United Kingdom (UK) from 2012 to 2016, by age group. In 2016, Internet access was higher among younger individuals with 98 percent of responding adults aged between 16 and 24 using any device to access the internet in any location. During the survey period, it was found that 97 percent in the group of respondents between 25 to 34 years of age used the internet. However, in general a trend is visible that those in older age groups were less likely to use the internet than those in younger age groups. "Do you ever go online? This could be at home or at work, when out and about or elsewhere. It could be through using a fixed broadband connection, perhaps Wi-Fi, or through a 3G or 4G mobile network signal." ** Effective Weighted Sample. Number of respondents in previous years: n (2012) = 1,805; n (2013) = 1,642; n (2014) = 1,890; n (2015) = 1,841. *** November to December 2016 was the date of the most recent survey. Everything On "New and non-internet users in the United Kingdom (UK)" in One Document: Edited and Divided into Handy Chapters. Including Detailed References. Statistics on "New and non-internet users in the United Kingdom (UK)"
How long has your household had internet connection and about how long have you been going online? To what degree do you agree or disagree with the following statements concerning the internet? Do you believe internet access should or should not be a human right?